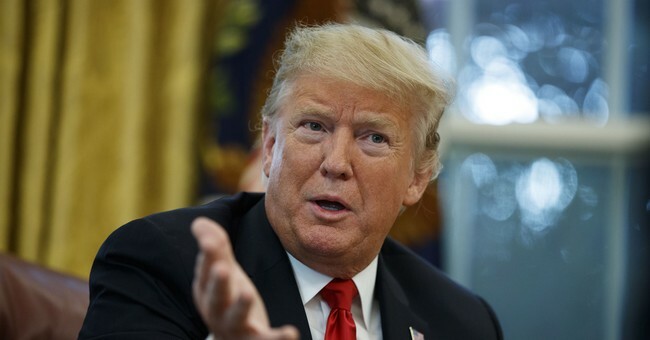 President Trump issued the first veto of his presidency Friday afternoon against a resolution passed by the House and Senate to end the national emergency declaration on border security. Twelve Senate Republicans sided with Democrats on the issue. “Today I am vetoing this resolution. Congress has the freedom to pass this resolution and I have the duty to veto it," Trump said from the Oval Office. “People hate the word invasion, but that’s what it is," Trump continued, calling the resolution "dangerous" and "reckless." "Today I am vetoing this resolution," Pres. Trump says. The President was flanked by DHS Secretary Kirstjen Nielsen, Attorney General William Barr and number of other law enforcement officials. Angel Moms, mothers of children killed by illegal aliens, were also in attendance. "The fact that this is an emergency is undeniable,” Nielsen said. Barr also made remarks and said President Trump's emergency declaration on the issue is "firmly grounded" in the law. Earlier today, President Trump thanked Republicans who voted against the measure. House Speaker Nancy Pelosi will hold a vote to override President Trump's veto in two weeks. The White House is confident she doesn't have the votes to do so. One good thing about this legislation is that it proves that court intervention is not needed or appropriate. There is an appropriate way to deal with a president who uses emergency powers in a wrong way. And it requires a veto-proof majority to do so. Courts should only be involved when laws are being broken or the Constitution is being violated. Neither apply here. The funny thing is that if they veto it, he can issue a new declaration the next day. And he will. Keep doing it then until 2020..
Democrats are discovering an immovable obstacle: Trump. Should keep them well occupied for the next two years. Unfortunately by then will have 50 million invaders who will most likely be granted voting rights! So scary! Yowzer! I didn't see that coming!! Pelosi: On March 26, the House will once again act to protect our Constitution and our democracyThe Drug Cartels and Child Smugglers from the Presidents emergency declaration by holding a vote to override his veto. Just watched the tape...TRUMP is a master at turning the tables on his enemies!! Mr Barr was EXCELLENT!! The dirty dozen should be ashamed of themselves!! NOW FIRE THEM!!!!! We need to repeal and replace THEM!!! YES WE CAN!! The resolution was an attempt to make the President look ineffectual, and if anything, this is a fool’s errand. Over, under, around or right straight through the middle, Donald Trump is a force of nature, and not easily dissuaded in anything. If that fact had not been suitable impressed upon people before, maybe they need another demonstration. Good for the President. The 12 misinformed Republicans that went against the border wall should be ashamed of themselves. There lack of Security for America shows us that they align with the communists Democrats on no borders. They are so damn dumb we have to make sure that those coming up for reelection in 2020 get kicked out. There you have it, the Cesspool of 12 got part of what they deserved. Glad to see Mr Barr siding with our President and upholding the law .This argument that the Republicans tryed to use that the emergency declared on our boarder is unconstitutional is nothing more than posturing how in the hell is a law that’s been on the books sence 1976 unconstitutional that’s the question that needs to be asked often.. They got their chance to virtue signal how moral they are - knowing it would be ineffectual. If a veto over-ride comes up they will probably change their votes. ... skillfully implying that the Republican turncoats who voted against our national security will NOT face the same reaction. President Trump does the right thing for America AGAIN! Finally, a President with integrity and balls! Continue to protect us from the Drug Cartel-owned US Congress! Notice 3 of those Rs that voted against him were Presidential candidates? If McCain wasn’t busy feeding the flowers, it would have made it another. In fact, it would make it 2 more, because he would still be controlling Graham.